The jumpers are slowly emerging from the dusty depths of the wardrobe, we’re all starting to (guiltily) pop the heating on for a few hours in the evening, and every other photo on Instagram is of a Starbucks pumpkin spiced latte – it must be autumn! This season is my favourite. I love nothing more than wrapping up in a big coat, woolly hat and boots, going for a long walk in the crispy leaves in temperatures that you can see your breath in, and ending up in a pub for lunch by the fireplace. Yes x 100000! With the arrival of colder weather disappears my cravings for salads and BBQs, replaced instead with soups and comforting hot meals. 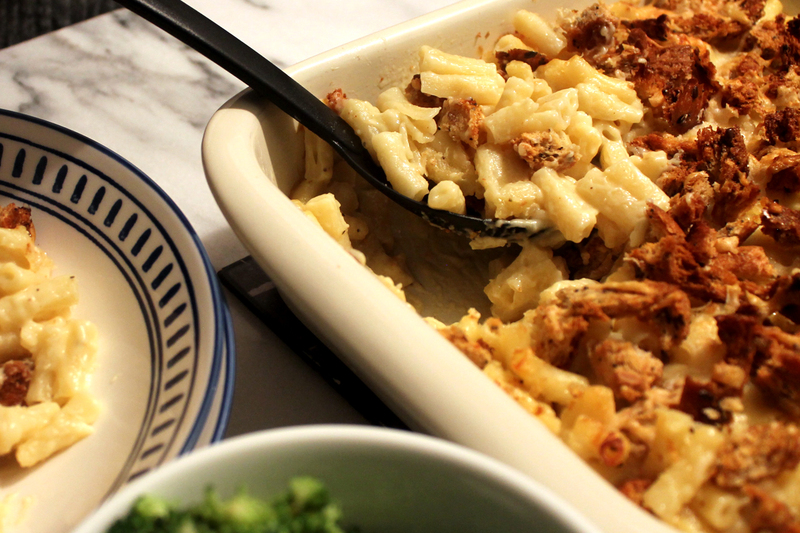 When the temperature dipped for the first time last weekend, I fancied a bellyful of hot gooey grub and here we are; my macaroni cheese recipe. 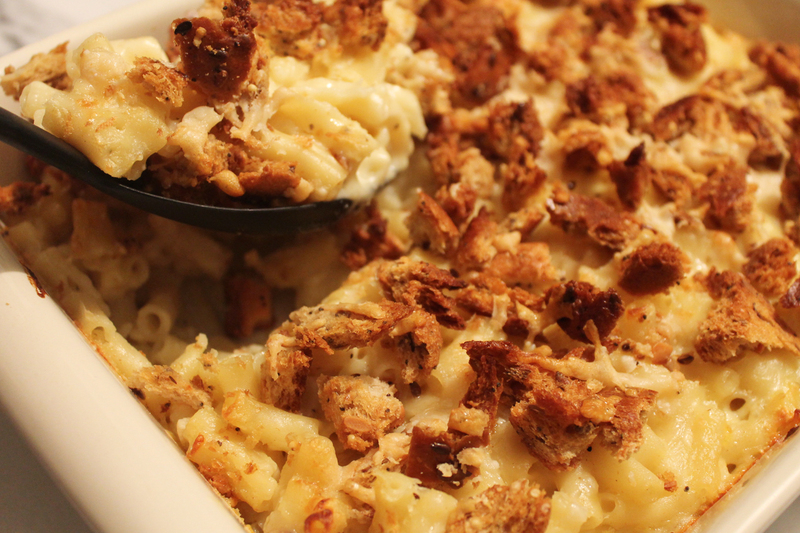 Mac n cheese is one of my boyfriend’s favourite meals and he said it was the best he’s ever had – high praise indeed! This recipe makes four hearty portions and it’s best eaten on the day. 1. Preheat the oven at 180C. Break the bread into small pieces and scatter across a baking tray. Melt two tablespoons of the butter, pour over the bread and toss using your hands. Pop in the oven for 6 minutes and once crispy, put to one side. 2. Boil the macaroni for around 8 minutes, drain, and set to one side. 3. Put the other two tablespoons of butter, garlic granules and mustard (if using) into a saucepan on the hob and stir until melted. Add two tablespoons of plain flour, and gradually add the milk while whisking. Then add the remaining three tablespoons of flour slowly – add seasoning as desired! I used black pepper here, but I’m keen to try paprika another time! 4. Whisk the mixture until it becoming a sauce-like consistency – this can take a while, usually around 5-7 minutes, but keep the hob on a low heat and don’t be tempted to whack it up – be patient! 5. Once thickened, take the sauce off the hob and add both types of cheese, grated. 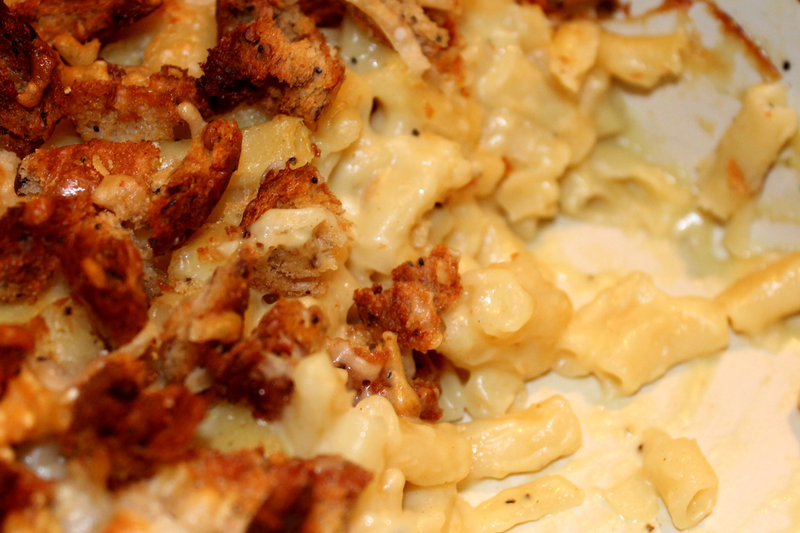 Combine thoroughly and then add the macaroni. 6. 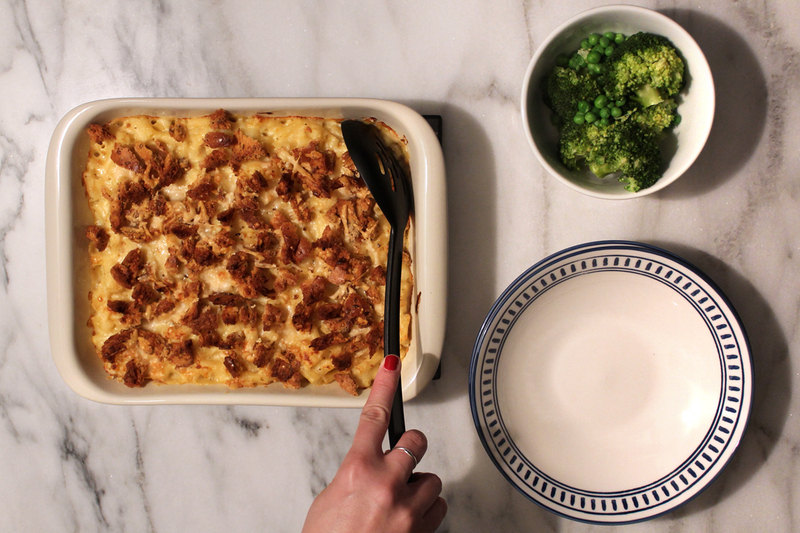 Transfer into a large ovenproof dish and sprinkle over extra cheese as desired, plus the breadcrumbs. Pop in the oven on the bottom shelf for 20 minutes and voila! Serve with green veggies or if you’re really serious about bulking for the winter months, garlic bread. Yum!